What causes ringspots on Pachysandra? Pachysandra is a relatively problem free plant and is widely grown as a ground cover in shady areas. The most common disease is Volutella blight caused by the fungus Volutella pachysandrae. Dark blotches form on the leaves and the stems. These increase in size until the plant is killed. Plants may be killed in patches within a bed. This disease is most common when plants are stressed by winter injury, insects, transplanting, mowing, drought or exposure to full sun. A relatively new disease of Pachysandra in the northeast is caused by a virus known as alfalfa mosaic virus (AMV). The virus was first reported on Pachysandra in 1982 in New Jersey and is the only virus known to occur on Pachysandra. Symptoms include chlorotic ring spots and blotches on the leaves. This virus is transmitted by a number of aphid species including the green peach aphid and others. It is also transmitted via seed or infected sap. Alfalfa mosaic virus has a broad host range that includes over 600 plant species in 70 families. Symptoms vary quite a bit depending on the host and can include wilting, white spots, stunting, ringspots, mottling, mosaic patterns or necrosis. 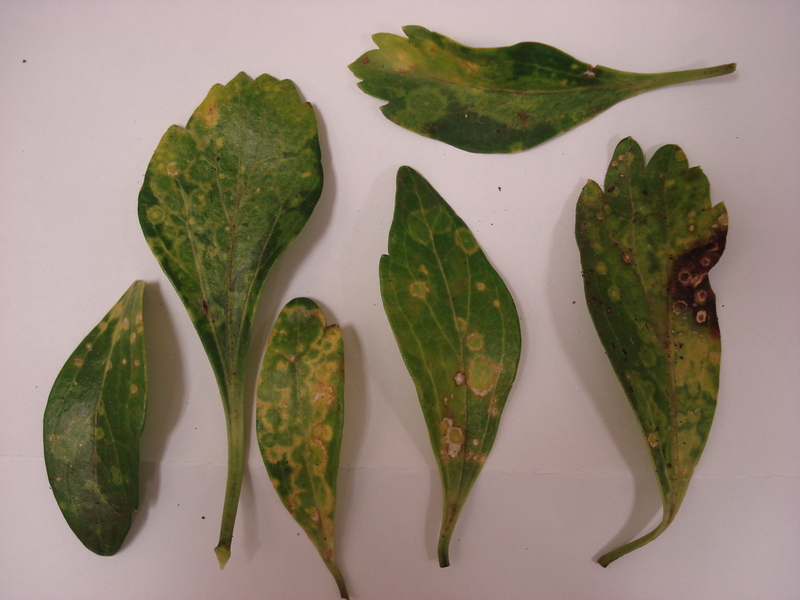 Symptom expression is also affected by the weather, strain of the virus and the age of the plant when infected. Alfalfa plants can be infected without showing any symptoms. Plants growing near alfalfa fields are at the highest risk of infection. Control of this disease is not always necessary. Prevention by avoiding planting hosts near alfalfa fields is the most effective. Managing this virus by controlling the aphid vector population has not been successful. In the case of Pachysandra, removal of symptomatic plants as they appear is the best approach. Avoid wounding adjacent healthy plants to prevent sap transmission of the virus. Scorch can also occur on Pachysandra and is caused by environmental factors including winter injury or drying. No treatment is necessary; the plants should recover once new growth appears in the spring. Scale insects may infest Pachysandra. The three most common are Euonymus scale, San Jose scale and Oystershell scale. Control measures for these insects include insecticidal soaps, horticultural oils and conventional insecticides. Another option for severe infestations is to mow the Pachysandra and collect the clippings to physically remove the scales. New growth will develop from the stolons.